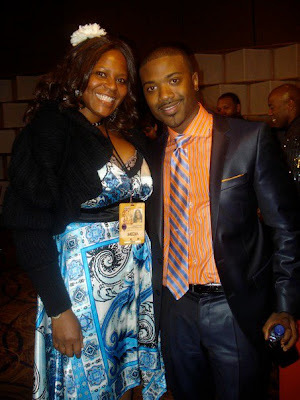 My girl Stephanie Abdullah rocked out at this year's Soul Train Awards Weekend in Atlanta. While there, she served as a creative correspondent for CREATIFFCHATTER.com. Check out her lively recap of this year's events. Let’s give it up to BET and Centric for bringing back our favorite award show-The Soul Train Awards! This year’s show features talent you can’t get enough of and others whom you’d like to see more of. Atlanta hosted the show for the second consecutive year, yet this time at the Cobb Energy Center. You take YOUR pick, but the man of the hour for me was El DeBarge! Can we say “come back” of the century??? You gotta tune in for the Soul Train pre-show because El and Faith open with the hot mid-tempo song, Lay With You from El’s forthcoming Second Chance project (in-stores & online, November 30th). His vocals haven’t changed one bit and the man has got to be about 50, when I say FINE as he EVER was-man I was Mrs. James DeBarge back then, but El, right now is what’s up. And how bout, he gave me a “Hey Girl!” I’m still fanning myself. Congrats to you Mr. Eldra DeBarge and Welcome back to where you’ve always belonged-in my Welcome Back Kotter voice-“well the names have all changed since you ran around, but the dreams that remain can’t be turned around. Who’da thought they lead ya-back here where we need you!” I’m just putting it out there, but can we get a DeBarge reunion tour jumping off? I’m just saying! 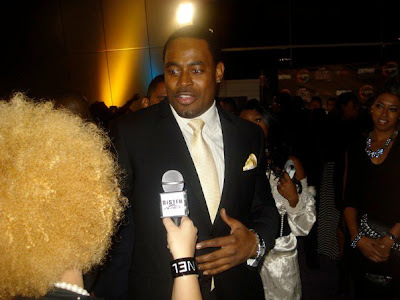 Next to El, my second favorite moment was greeting my boy Lamman Rucker on the red carpet (which was purple by the way!) The man looked me up and down. I thought he was peepin the fact that I’d taken off my shoes and was down to my socks! But, no!!!! “I’m not looking at your feet. I’m looking at you….ALL of you…because I haven’t seen you in so long!” Can we say nearly fainting on the carpet! Shout out to Ericka Boston of Sister 2 Sister for taking that quick pic of me and Lamman! Er’body was on the purple carpet: Chili and her boo. He’s white by the way and a cutie. And Chili just won’t age. She’s keeping it hot and fly! Go Chili. My girl Kita and her girl Mo…i.e. Kita and Mo from the T.O. Show were stunning in silver on the carpet. Shout out to them for creating, executive producing and starring in their own reality show while still keeping up with their publicist duties! Free and AJ were on the carpet-not together, but it’s good to see them. Sorry BET, but 106 & Park hasn’t been the same since they left. Here’s a suggestion-how about the Free and AJ show-targeted to the 30s and up crowd????? Haven’t seen Sunshine Anderson in a minute, but she was there looking fly. And I didn’t even recognize Melanie Fiona until I saw her accept an award during the show! But, she was rocking out on the carpet and looking stunning. Dwele and Tank made their way down the carpet and Tank performed during the show. You’ll see how he inspired Jamie Foxx’s Unpredictable album once he takes to the piano during his performance. Tank nailed it…to my surprise. Biz Marki and Kid Capri were on the carpet too. Kid’s looking all grown man. Nice to see our legendary hip hop DJs still doing what it do. And why is Doug E. Fresh looking so young now? Awhile back he’d put on some weight, but it sholl is gone now! Looking good Dougie! Catch him teaching CNN’s Wolf Blitzer how to Dougie! Where in the world did they pull Wolf Blitzer from and why?????? It was super cute though! Who else breezed down the carpet? I’m tryna think?????? Oh yeah, how could I forget the S the Double the U the V. Still loving Sisters With Voices. They are still bringing it. So, don’t miss their performance. Janelle Monae-beautiful! Demetria McKinney from House of Payne-she’s super tall (or was it her shoes?) She’s very beautiful and had real good energy about her. 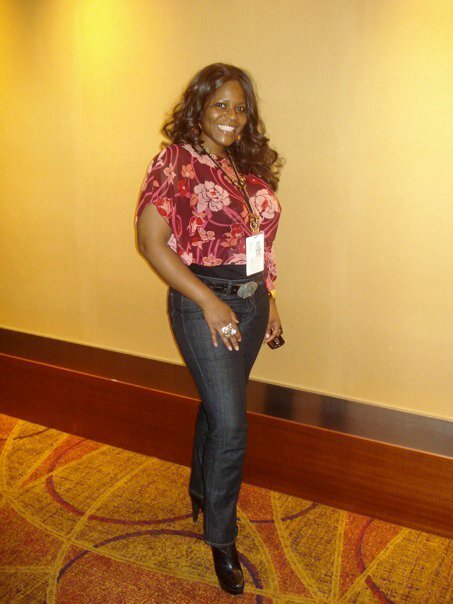 Keisha Knight Pulliam-Rudy is all grown up. She and Raven Simone introduced an award; too cute. Jesse Jackson even made his way down the carpet…well…out to the carpet…not sure that he actually did press. Production turned the power off on the carpet and y’all know what it means when the lights go off-get in the house! It was an effort to get the show started on time. Well, the show still ran until 1:30am! It’ll be really interesting to see how they edit it down to two hours. For your musical and viewing pleasure, R. Kelly opens the show! While he misses a note during the performance, it in no way spoils the rest of his set. He nails a medley of his hits before going into his new single-When a Woman Loves. Watch him rip it! He’s looking all yummy these days with his hair cut all low. I heard the album, which came out last December is da bomb! I gotta get it-on real CD. I like the whole packaging thing. I-tunes is good for singles, but with Rruh, I gotta have the real thing. Anita Baker and Ronald Isley received Lifetime Achievement awards and were honored with performances of their hottest songs by some of today’s hot artist. Dionne Farris of Arrested Development even rocked out on one of Anita’s songs! 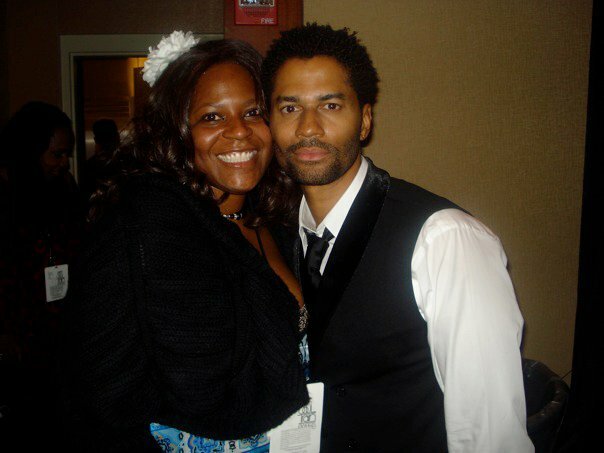 El was apart of the Ron Isley tribute as was Eric Benet. Shout out to Eric. I worked with him during my brief stint at Warner Bros. Records and he always shows me love! I might have missed it, but was there a gospel performance during the show????? Hmmmm Don Cornelius always had one, if I remember, right? The Soul Train scramble board is ridiculously funny. So, watch out for that. I was hanging out in the Soul Train Social Media lounge throughout the show. BET downgraded their media center to just a few key one on one outlets and set up a social media lounge. The room was filled with folk like me, tweeting, Facebooking and blogging about the show. Such a great idea! Keep that going. It definitely gets people hyped for the show, which airs on November 28th on both BET and Centric. BTW, Centric airs old Soul Train episodes. Call your cable operator if you’re not getting Centric. I didn’t see her take the stage, but India.Arie was in the building and seemed to really be enjoying herself. Isn’t Cee-lo from Goodie Mob? He just done became a character and left them in the dust. See him in a crazy solo performance of F You and in the Ron Isley tribute. Ron Isley-51 years in the game! Shout out to R. Kelly again cuz he revived that man’s career with that Mr. Biggs stuff. Yall remember that video? Brought Ron and the Isley’s back to life and they ain’t looked back since. Man, next year, Soul Train needs to get Charlie Wilson and the Gap Band. Snoop and ‘nem helped bring Uncle Charlie back. Shout out to “new” skool bringin back old skool. They need to bring somebody back-all the daggone sampling of these people’s songs they do. Shout out to all the talent who cared enough to stop by the social media lounge: Eric Benet, Kim Fields, El DeBarge, Ray J., Fonsworth Bentley, Dionne Farris, Anita Baker, Elise Neal, Lalah Hathaway, Rachelle Farell, and Ginufine-Ooops I meant to say Ginufine-oops why do I keep doing that? Ginuwine was in the building! And Elgin Lumpkin is still yummy. Sole was in the building too. Guess they keeping it together. Sidebar-why does Kim Fields look like Janet Jackson? BTW, she said her favorite Soul Train moment was when she appeared on the show and sang-Dear Michael. Some of y’all don’t know ‘bout that song right there! But, if you know me, soon as she said it-I burst out with the chorus on her!!!! LOL Just cuz we are talking about favorite Soul Train moments, who really can pick just one???? My favorite Soul Train moments are ALL of the episodes on which New Edition and DeBarge appeared. However, my favorite Soul Train award moment may just be the dance battle between Taraji and Terrance. Catch Terrance and his boys stanky leggin while Taraji and crew whip that hair! She wore a cute red and black short outfit during the battle. But, from the back, she was looking really Olivia Newton John in that last performance scene from Grease! Now, that I think of it, the Boyz II Men Soul Train Award opening with Please Don’t Go back in 1993 ranks pretty daggone high on my list of favorite Soul Train Award moments. Man, we used to be late for the awards every year and miss the opener. But, we knew the Boyz were opening with that and we wouldn’t miss one note! Yeah, that’s how long I been Soul Train Awarding! My very first one was in 1990. We snuck in! LOL! Then we bumped into Tommy Brown and of course he got us into all the VIP action. I have DIGRESSED! 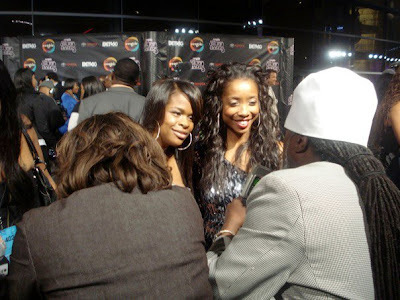 LOL All and all the Soul Train Awards 2010 was hot! All photos courtesy of Stephanie Abdullah. Ray J and Brandy look just alike. Lamman need to keep his eyes to himself....dirty old man. LOL Yay for El and anyone old school for reminding us how good we had it. Free and AJ for the 30+ club indeed!